Trouble Child is an art and literary magazine focused on work that explores the feeling of uncertainty. We want to know your anxiety and upheaval, to live what you lived, honest and raw. Uncertainty is a universal experience that manifests differently in all of us. We know how it feels to us. How does it feel to you? We are uninterested in being gatekeepers of the terms writer or artist—send us your work! We welcome poetry, prose (fiction and non), visual art, and oral storytelling (yes, we have a podcast: check out Trouble Children). If you’re working on something that doesn’t fit neatly into one of those categories, send it anyway! We’d love to get to know your cross genre and experimental work. At Trouble Child, we value the relationship between editors, artists, and writers. We believe that a strong artistic community is cultivated through open dialogue, respect, and reciprocation. Check out our submissions page for more information. 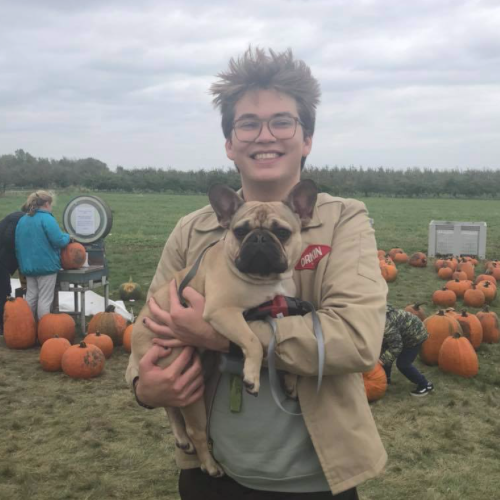 Ben Schroeder is a graduate of the University of Minnesota Twin Cities with a BA in English literature and creative writing, and he is currently in Spain worshipping the moon goddess. His poetry has appeared in The Tower and his prose has appeared in or is forthcoming from The Wake, MURAJ, and Great River Review. Trouble Child’s Andrea Nelson asked Ben about his experiences in Spain and The Haunting of Hill House—check out their conversation here. Bridget Dugan is a senior at the University of Minnesota Twin Cities. She enjoys pseudoscience and talking about meat sweats. She plans to scam her way into a role on Broadway at the age of seventy, and she doesn’t have any plans besides that, so she would love to hear your suggestions! Fellow Trouble Child team member Summer Freed interviewed Bridget about her passion for editing and “The 36 Questions That Lead to Love” here. Aubrey Asleson is a graduate of the University of Minnesota Twin Cities with a bachelor’s degree in English and gender studies. She’s passionate about two-story antique shops and the Mamma Mia! soundtrack, and her plans for the future include at least one vegetable garden. Her work has appeared in The Tower, Errata, and Periphery Journal. Mara Rosen interviewed Aubrey on fiction and writing after college. Check out their conversation here! Koryne Martinez is a senior at the University of Minnesota Twin Cities studying English and creative writing. She prefers life to happen in constant motion, but she’s an ENFJ and can be tied down with the promise of emotional conversations over gin cocktails, brunch, or a Catan board. Her favorite things include, in no particular order, lipstick, a good cabernet, and ranch rice cakes. Veronica Crichton-Hill talked to Koryne about her love for nonfiction writing and her favorite trash TV—check out their conversation here. Andrea Nelson graduated from the University of Minnesota Twin Cities with a bachelor’s degree in English and medieval history. She works as an educational children’s book editor and moonlights as a story editor for Paper Darts art and literary magazine. Her interests include cats and potato-based foods. Fellow Trouble Child editor Ben Schroeder talked with Andrea about her work with Paper Darts and her trip to Paris. Check out the interview here. Jeyca Maldonado-Medina is a graduate of the University of Minnesota Twin Cities. She is a Puerto Rican journalist who loves all things audio. She has worked for MPR, the Star Tribune, the Current, Terrible, Thanks for Asking, and Radio K. Jeyca will buy into almost any conspiracy theory you throw her way. Jeyca sat down with Emily Hill to talk about her love for writing and creating content. Read their conversation here! Gabriella Granada is a senior at the University of Minnesota Twin Cities. She credits Thai food, Carrie Fisher, and her raw, unabated rage for where she is today. She’s a Gemini and an ENTP—so, a monster—but she promises she’s, like, a chill, normal girl. Her writing has been published in City Pages, The Riveter, The Tower, and The Wake. Trouble Child’s Fletcher Wolfe interviewed Gabby about Carrie Fisher and quantifying success. Read their conversation here. Fletcher Wolfe will be graduating in Spring 2019 from the University of Minnesota Twin Cities with a BFA in art. They enjoy Billy Joel, cardboard, Hanes sweatshirts, and peach cobbler. Their artwork has been featured in several group exhibitions and festivals. They currently work as the president of Phony Magazine and as a technician in a laser cutting lab, primarily making laser-cut faces of Jimmy Stewart. They have previously worked for Adventures in Cardboard, Tamsie Ringler, and briefly as a dog photographer. Gabby Granada interviewed Fletcher about their love of dogs and Spaghetti Yeti—read more here. Summer Freed holds a bachelor’s degree in cinema and media culture from the University of Minnesota Twin Cities, where she also studied leadership and Spanish. She developed an affinity for marketing and event planning through experiences with Phony Magazine, the Schubert Club, and Patrick’s Cabaret. Summer now spends her time on freelance branding work, teaching improv theater, and deep diving into television. Trouble Child’s Bridget Dugan chatted with Summer about her dream event planning gig, coaching improv, and more. See the interview here! Mara Rosen is a graduate of the University of Minnesota Twin Cities with a degree in English and history. Her interests include poetry, empathy, and Indian food buffets. She’s a quadruple Libra and doesn’t actually know what that means, but chances are she’ll tell you anyway. Aubrey Asleson asked Mara about poetry and being a Libra—check out their conversation here. Veronica Crichton-Hill is in the BFA art program at the University of Minnesota Twin Cities. She prefers to go by Vee but will never introduce herself that way because everyone hears it as Lee. Her hobbies include reading three books at a time, fronting a band, and planning her next dream vacation while riding the bus to school. Read Veronica’s interview with Trouble Child’s Koryne Martinez about photography, music, and more here. Emily is a senior at the University of Minnesota Twin Cities studying graphic design. She has worked for various companies and individuals doing freelance work as well as working as a technical designer at Anthem! in Northeast Minneapolis. Her artwork has appeared in The Wake, The Tower, and an exhibition through the Soap Factory. Outside of work and art, she is interested in ten-plus-hour nights of sleep, drinking water, and occasionally canceling out healthy habits with cream cheese wontons and martinis. Upon meeting her, expect to dedicate five to ten minutes of your time listening to her talk about a small animal she saw a week ago. Emily chatted with Trouble Child’s Jeyca Maldonado-Medina about her art and her personal style. Read their conversation here!